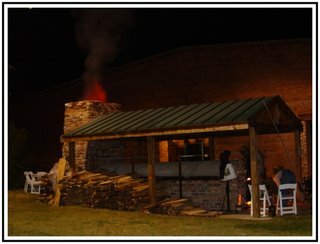 Another firing was accomplished over a two day period in the groundhog kiln. As firings go, it was a little more difficult and protracted than usual. Cooler weather was called for by the weather guy, but I swear I didn’t feel it. I did feel the 30% chance of rain all night and into the next day. It blew under the shed and dampened the wood a bit, slowing down the process and making things real uncomfortable. 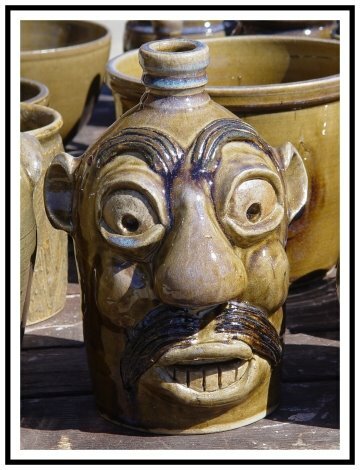 Below is a photo of some folk art that came out of the firing. 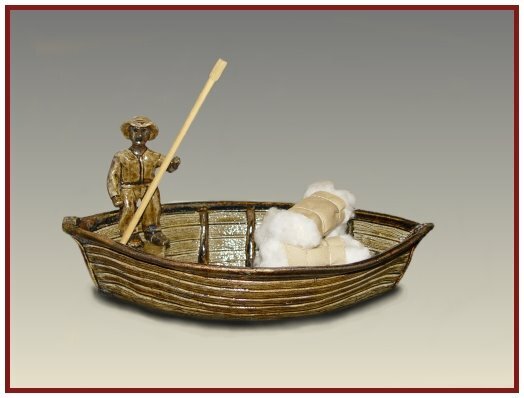 It is based on the Petersburg boats which hauled bales of cotton down the Savannah River to the cotton mills in Augusta, GA.
Me, being the trooper that I am, just kept on chunking wood. I stopped and stirred the coals frequently as the wood was not burning as efficiently as usual, probably due to some dampness. Things finally got roaring pretty good at the 18 hour mark, about 4:00 a.m. 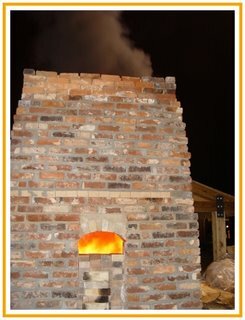 In the photo below, the kiln is starting to be blasted. 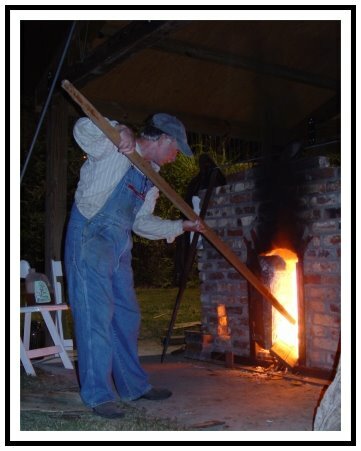 The flame runs from one end of the kiln to the other and then up about 12 feet of chimney!In other words, the flame travels about 32 linear feet! I’m bent over poking and kicking in all of the wood I can get in at once. The flame is allowed to burn back down and then the stoking cycle is repeated. It goes on like this for a couple of hours. Hopefully, I stop in time and don’t melt down the pots in the front row. Well, you’ll never guess what happened! You know all of that black smoke in the previous photo? It brought us some company in the early morning hours! Yes, a whole great big ladder truck with a fire crew came rolling up to the kiln. We had quite an exchange as they tried to figure out what I was doing. They thought I might be adding a little accelerant to my fire, which I assured them I hadn’t. I thought we finally came to some sort of understanding…. I cranked it back up again, making up for lost time that the fire guys cost me. Here, the flames race up the chimney. This is a view from the rear. Some bricks have been removed from the opening in the chimney to act as a passive damper which slows down the draw of the chimney. A few hours later as I was just about to finish, the fire truck rolled in again. 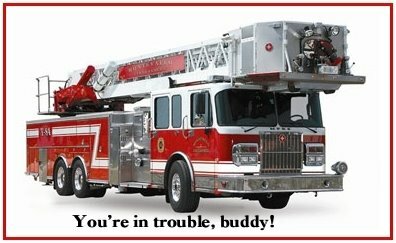 This time, some of the fire guys were real angry. I tried to talk about the understanding we had reached 2 hours earlier, but they seemed to have forgotten about it. They were intent on revealing the operating costs of the giant machine and crew. We exchanged phone numbers and addresses. They probably want to send a Christmas card or something! This is exactly my expression! You could’a knocked me over with a feather. I was real tired at the end of it all, which was about 28 hours straight. Here’s some of the pots as they were unloaded a few days later. I put just a smidge of rutile in the glaze batch and it sure went a long way! You can see it in the form of bluish highlites here and there. I can’t wait until the next firing! It sounds like your neighbors might not appreciate the glory of what is transpiring in their midst. I have to tread carefully on firing day. It is amazing how little smoke it takes to send the civilized mind of modern man into a complete meltdown. Maybe it is all just a misunderstanding and your neighbors will calm down when they find out where the smoke is coming from. If not, I hope the corn cobs are removed from their back ends before your operation suffers. 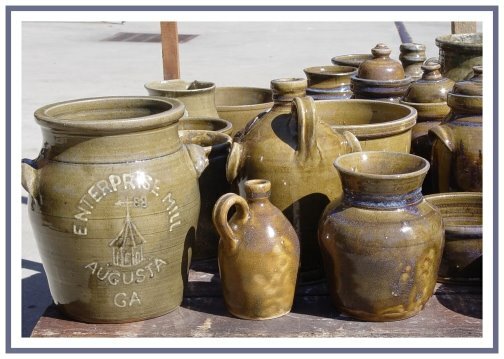 In any case, it looks like a successful firing of some very cool pottery. Thanks for the encouragement, Slag! I’m in a very public place in the middle of a medium sized town.I usually sneak the hottest, most frenzied parts of the firings in during the wee hours of morn when there are few eyes to spy the reductions of a ramped up groundhog kiln. I’ll have to use the good ol’ boy system to find a way around my smoke troubles. Your kiln looks mighty appealing! Even the wheels speak to me.I wish I could find a web page with your work. I’m a real admirer! Thanks, a website is in the works. I built my little raku kiln from junkyard scraps. I slap wheels on just about everything these days, gotta move stuff around when you live in residential neighborhood. You know, with winter coming on, the smoke should be less noticeable with all of the chimneys blazing away. Well done. I’m glad you got it all fired up. I can only imagine what must have been going through the minds of the callers driving on the road that sort of looks down on your kiln. They probably saw fire and smoke coming from the brickwork and though the worst. Your stuff looks great. I don’t know what rutile is, but I like what it did.